A basic rule of website design and marketing is that you need to be ready to change — often. Our websites have been evolving at an increasingly rapid rate with the advent of new technologies, business practices, security issues, and more. The change process has been both easy and difficult. If you look through the CNRGP network of sites, you’ll see at least four variations. This is because after we introduced a new “standard” we discovered further revisions needed to be made. Rather than risking trashing existing sites, we have left things as they are. Work on the latest design started in September 2013, with our business decision to rebuild our U.S. presence, initially with a new site for South Carolina at southcarolinaconstructionnews.com. The project had starts and stops as the external contractor hired for the work encountered security challenges and then experienced further delays when a key designer could not finish his work in a timely manner. The new design is based on the “responsive design” principles — that is, you can read the website on different media including mobile devices. It has other accessibility and social media link functions (not all of which still work perfectly). The design allows us to update content frequently, yet provide complete graphic copies of the full printed issues. We’ve been able to retain some key elements of the old design which proved effective for communication and lead development. 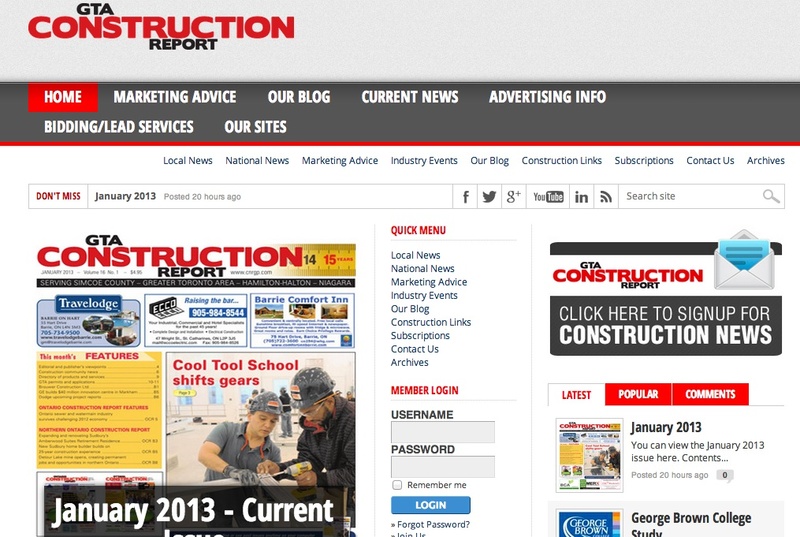 This weekend, while the new site isn’t pefect, I believed we were ready to make the switch to turn it on live for Ontario publication GTA Construction Report (www.gtaconstructionreport.com). In the next month, we’ll update other Canadian sites and the new U.S. sites in the revised design. A challenge in website design is weighing the design issues with response. If we produce a “great” design but few people return — or worse, few prospective advertisers or subscribers decide to participate — the design is a failure. In the ideal world, we would do a/b testing of different design elements and constantly tweak and update the design. This might make sense when the business is a bit larger and we have the resources for more in-house or contracted suppliers. In the meantime, I’m reading the literature, and this has caused some revisions — for example, turning the “carousel” off on the main page 1 image. Please feel free to comment. And of course you are welcome to subscribe by email for site and news updates.